(Micah, Michail, Miguel, Michel, Mischa, Misha), known in both the Old and New Testaments as the angel protector of Israel. In eastern Christianity he is also venerated as having care of the sick. Traditionally, he is patron of all who live and work at sea. He is also patron of grocers, banking, paratroopers, the police, servicemen and of Brussels, England, Germany, Papua New Guinea and the Solomon Islands. His feast is September 29. This statue is 12" tall and is made of a resin-stone mix. 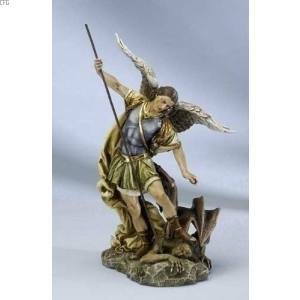 It is a very detailed depiction of the great battle between St. Michael and Lucifer, in which St. Michael was victorious. A great gift for a police officer or serviceman/woman!